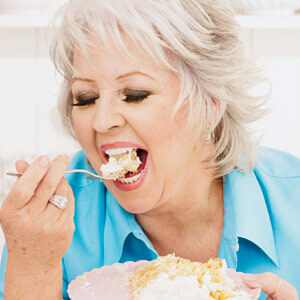 When matronly maven Paula Deen announced she had Type 2 Diabetes last week, it raised much ire. No, not because of her contracting a nearly incurable disease, but because she took so long to announce her diagnosis—over three years. What these critics don't realize is Ms. Deen knows what she's doing. Why take three years to announce something this big, especially when it could affect your livelihood and ability to appear on television? Well, aside from the fact that it could affect her livelihood and ability to appear on television, it was because she was building a new type of super insulin. One not just for Type 1 diabetics, but one any and everyone can use (but probably shouldn't). It's called, Deliculin, the delicious insulin. Deliculin, made by diabetes product manufacturer Novo Nordisk, is like normal insulin—which brings glucose into the blood cells—except it tastes delicious. Most Type 2 diabetics do not need to use insulin, it's only when their blood sugar control goes to crap they resort to it. However, if there's a delicious insulin that tastes like frosted fried chicken swimming in butter, Type 2s might intentionally get switched to an insulin regiment, because, yum. As a Type 1 diabetic, I fully support this groundbreaking research. “And it smells amazing too!” claimed Deen on the unveiling of the product. One of the more offsetting features of insulin is it has an awful medical-ly smell. It's like a big vial of band-aids in liquid form. With flavored and pleasant smelling insulin, I'm certain my old roommate's brother would have actually loved it when I drunkenly sprayed him with insulin at three in the morning, as opposed to the tantrum he (apparently) threw. Deen didn't just showcase the frankenfoodcure, she showcased the delicious eats possible with just the smallest application of Deliculin. Included in the cooking demonstration were how to bring insulin into everyday cooking. From beta cell coated carrots to islet ice cream, everything looked absolutely delicious. The piece de resistance was a Deliculin basted turkey stuffed with high carb stuffing. “People have been putting insulin into themselves for years with syringes. And what's a turkey baster, but basically a big syringe for a bird?” Deen quipped. Frankly, this whole move doesn't surprise me. I knew she always planned ahead. Like that time when she slayed that Sasquatch, I said to myself “She's never going to be able to use all that meat. It's all going to spoil, and then we're out a cryptozoological mainstay.” What she came up with though, was amazing. Sasquatch steaks, Yeti's Pie, Gruel, and deep fried Yeti lung were the basic items. She even marinated its eyes in butter and served it as an amazing appetizer. Heck, it wouldn't even surprise me if she was the boy who cried diabetes in this case just to use that as a marketing hook. And finally, those who have read the Wikipedia page on “Insulin Therapy” might have noticed how they claimed oral insulin doesn't actually work. Something about being hard to get a protein like insulin to actually absorb correctly. Well, Paula Deen is just that magical, that she overcame that quandary... or it was vandalism... or diabetes doesn't actually exist. All of those are very valid solution and attest to her A1C tipping greatness.